Spectra Helpline asked us to come up with a new way to build awareness of Elder Abuse issues in Ontario. Elder Abuse effects more than 60,000 Canadians each year. After some research on previous initiatives from other organizations, we realized that the campaigns always focused on elder abuse itself. We decided to talk to people around the elders who may be at risk, as well as primary caregivers who are so often stretched beyond their resources. Being responsible for a senior can lead to increases in emotional and financial stresses on the caregivers — and that can lead to a situation where the elder in care may be abused. With a tight budget, we built up a two pronged strategy. A different, targeted message on each side of a standard rack card, pointing to a single webpage. 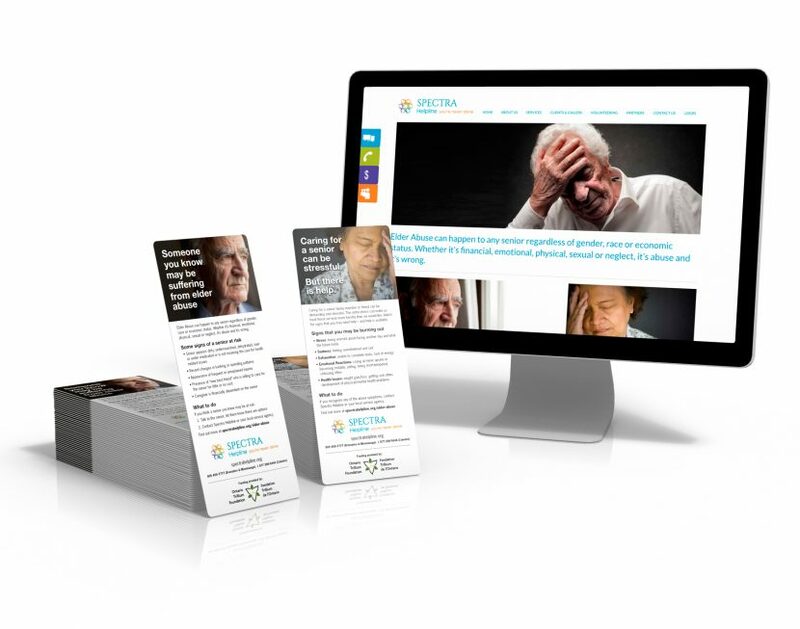 This page branches off with information on Elder Abuse warning signs, and a separate branch with all the support services available to Ontarians who are taking care of seniors. To keep costs down, we use Google’s translation tools to translate the content on the pages into all the many languages that the organisation supports.